Since TV has become more personal, Tmira faced the challenge to create the most intuitive and useful Video and PayTV apps, with user in mind, to let your viewers enjoy your contents everywhere and every time. We are specialized in Video and PayTV apps development for connected devices such smartTVs, HbbTV, OTT STBs, video game consoles or AndroidTV. Most of our developments are present in the catalogs of the major manufacturers, like Samsung, Sony, or LG. Our experience allows us to tackle any project with thorough knowledge of each platform, technical implications and the peculiarities of their certification process. All our applications provide high visual impact, business-oriented and easy to maintenance, migrate and evolve. 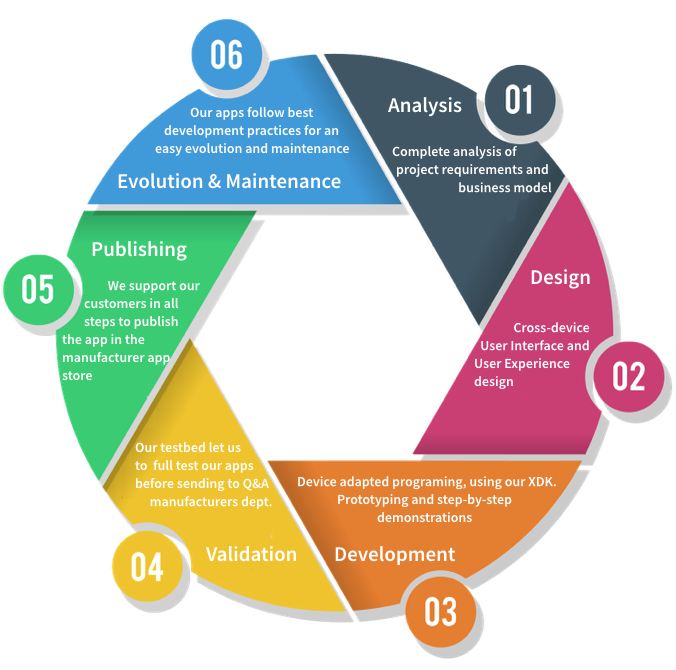 We support our customers in all applications life cycle: from UI & UX design to manufacturer Q&A and validation process. The only application does not guarantee success, and less in the case of payTV applications. It is very important to have an ecosystem that nurtures our application, from the content catalog management to the quality and capability of streaming services. Tmira offers a complete ecosystem able to feed your application: CMS, Cloud Playout System , CDNs, Access Control and Encrypted delivery (DRM), monitoring systems and statistics. And if you have your own backoffice or want to integrate your Video and PayTV apps to an existing solutions… no problem at all. Do not hesitate to contact us to learn how our apps has been integrated with third party solutions. The development and maintenance of individual applications for different platforms is becoming prohibitive for even the largest operators and media companies. Tmira drastically cuts development and maintenance cost as it delivers multiscreen client applications to every screen in- or outside the house.